Artwork is personal, whether created by you or purchased. An art collection reflects you: your tastes, your preferences and your personality. Adelaide Picture Frames works with you personally to ensure that artwork is enhanced by the way it is framed, stretched (in the case of canvases) and hung. Care is taken in the selection of materials and in construction to ensure that your artwork will be protected and preserved for many years into the future. All backing boards and mat boards are acid free. UV inhibiting and anti-reflection glass and conservation grade mat boards can also be utilised to provide the level of protection you desire. ​Importantly, all framing is reversible, so that, if necessary, the art item can be removed with no change to its state and therefore, its value. ​A range of sports memorabilia items including clothing, medals, ribbons and certificates can be mounted in box frames to show them off to best effect. Foamcore inserts are used in clothing to ensure that the material is stretched to avoid wrinkles, and pins and judicious stitching are discreetly employed to hold items firmly in place. Great care is used to ensure that fixing techniques will not damage items in any way, thereby reducing their value. ​Adelaide Picture Frames can mount and stretch canvases of any size. Canvases are treated with great care to ensure that the paint is not damaged in any way during the stretching process. Frames are built to be light weight but strong, with carefully fitted bracing to prevent twisting and buckling. Adelaide Picture Frames can mount your photos and artwork in a range of unusually shaped frames that replicate old-style traditional frames. 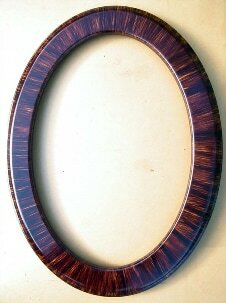 Bowed glass can also be fitted to the frames to create a unique result. ​Where bevelling is required, mirrors are made of glass with a minimum thickness of 4.5mm. Only mirror with high quality backing is used to eliminate the risk of deterioration over time. A special sealant is applied to mirror edging to ensure that mirror backing does not degrade close to the edge of each piece of glass. Mirrors can be mounted in a wide range of frames, built strongly to handle the weight of glass. Decorative designs can be incorporated into mirrors using coloured glass and copper foiling.